"There's a Whole Other World Going on Inside of Him." 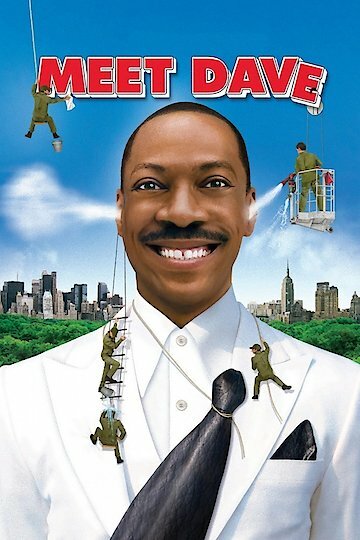 Meet Dave is a comedy starring Eddie Murphy as the lead character. Dave is not actually a human, although he appears to be one. Dave is actually a large spaceship inhabited by very small intergalactic travelers. Eddie Murphy plays the Captain of the ship who decides to name the humanoid ship Dave. Dave is walking down the street when he gets hit by a car driven by a harried single mom named Gina. Gina has a teenage son named Josh who takes a special interest in Dave. Since Dave is not an actual being, he does not respond to being hit by the car in a normal manner. Gina feels bad for having hit him and invites him up to her apartment so she can tend to his injuries. The story often switches between the view the space travelers have from inside Dave to the external view Dave has while interacting with humans. The main control room is situated in Dave's head and is staffed by a crew which includes a female officer who is second in command to the Captain. The humor takes place both inside and outside the ship named Dave. On the inside the space travelers have trouble deciphering what Earth words and phrases mean, which often leads them to use inappropriate responses for Dave's speech. The space travelers are on a mission to recover a small object which fell to Earth a few months before they came. It turns out that Gina's son Josh found the object and took it to his school for science. To complicate matters further, a police officer, played by Scott Caan, is searching for an alien craft he believes crashed to Earth. At times, some of the crew end up outside of Dave to make minor repairs or on one occasion, because they end up getting drunk. The interactions the little space travelers have with humans directly impacts the way they choose to live their lives. Meet Dave is currently available to watch and stream, buy on demand at Amazon, Vudu, Google Play, iTunes, YouTube VOD online.